Entry-level model Dynamic Moving Die Rheometer utilizing Rubber Process Analyzer (RPA) technology. The MDR 3000 Professional is designed for measuring the viscoelastic properties of polymers and elastomeric compounds before, during and after vulcanization. Operated both statically or dynamically, the data acquired provides insight into a compound's advanced material properties, processability, cure characteristics, cure speed, post-cure behavior, and vulcanized dynamic mechanical properties. Isothermal frequency sweeps provide detailed analysis on the molecular weight distribution MWD (crossover modulus) and the average molecular weight AWM (crossover frequency) for any elastomeric compound. Based on the frequency and given temperature during a test, mechanical properties can be easily predicted. 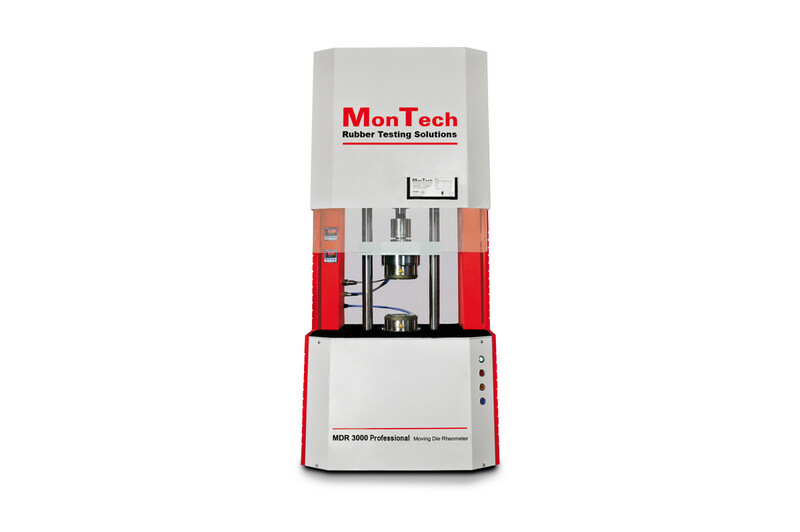 MonTech has incorporated additional advanced testing capabilities such as the Time-Temperature Superposition principle (TTS). MonTech rheometers can be used for WLF master-curve modelling, to predict material performance at temperatures and frequencies outside the normal range. Structural characteristics of elastomeric compounds influence material behavior during processing and final product performance. In order to simulate various processing methods or evaluate material states, tests are performed in the linear or non-linear viscoelastic range. MonTech dynamic rheometers conduct frequency sweeps over a large shear range to reveal substantial material characteristics pertaining directly to processability. Dynamic oscillatory shear tests, commonly known as small-amplitude (SAOS) and large-amplitude (LAOS) oscillatory shear tests, are an effective method for measuring viscoelastic properties of rubber compounds or polymers – an integral part of discerning material response in processing operations. 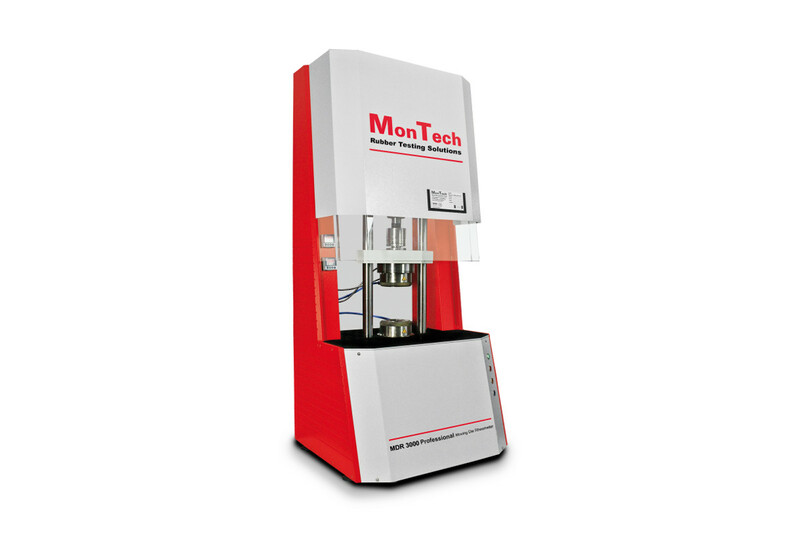 MonTech Rheometers can be equipped with a High-Speed Data Acquisition System. This enables Fourier transformation analysis of the periodic data, including full raw data access, for research into viscoelastic behavior. By using LAOS testing, the material stress response is easily quantified enabling a fuller understanding of filler content, structure, and polymer architecture. MonTech Rheometers provide precise test results at variable oscillation angles for ideal strain amplitude, optimal signal-to-noise ratio, while avoiding any structural breakdown or slippage of the sample in the die cavity. The variable oscillation angle can be set according to the needs of the compound. For example, a higher oscillation angle may better distinguish differences between batches of soft materials, such as silicones or epoxy resins. While a lower oscillation angle used with stiff materials may improve variability by minimizing strain induced damage beyond the linear viscoelastic range. Processing simulation is a powerful tool that can be used to shorten R&D times and aid with mixing quality control. MonTech Rheometers provide simulation capabilities for almost any possible production process, providing irreplaceable data for developing rubber compounds, by simulating manufacturing processes and environments. Strain Sweep for Filler Loading "Payne-effect"
The Payne Effect testing measures the stress-strain behavior of tested materials. Physically, the Payne effect can be attributed to deformation-induced changes in a material’s microstructure, i.e. to breakage and recovery of weak physical bonds linking adjacent filler clusters. By discerning the relationship between modulus and strain in the low strain/high strain areas, users can quantify filler loading, dispersion, and filler-filler interactions. The resulting material characterizations directly impact dynamic stiffness, damping behavior, and final product performance. Good processing performance is influenced by three main criteria: throughput flow, die swell and surface finish. The flow will be controlled by the viscosity of the rubber. The shear rate from an extruder and extrusion die can easily be calculated and used as the specific test parameters in a Rubber Process Analyzer test setup. A low viscosity will mean that rubber will easily flow through the extruder with low die pressure. Once the rubber is extruded it is required to be in the correct size. When leaving the die, the elastic nature of the compound will cause the rubber to expand, resulting in die swell. MonTech Rubber Process Analyzers can obtain the storage shear modulus G' at high strains (typically 100%) allowing an excellent prediction of die swell. The surface finish of the extrudate is required to be smooth, and not rough. Roughness tends to occur when a stick-slip resonance occurs between the speed of the extruder and the elastic response of the compound. Testing at variable shear rates using a frequency sweep allows the comparison of compounds that extrude with smooth and rough finishes, revealing processing differences. In filled rubber compounds, carbon-black particles form a network of mutually interactive agglomerates that can be measured and quantified using a simple D-RPA 3000 Matrix test. Storage shear modulus (G’) results at low strains (e.g. +/- 1%) are typically high and get reduced after a larger strain amplitude (e.g. +/-50%) is applied for a short period of time. With lower strain amplitudes applied over time, the reduced Storage shear modulus (G’) will partially recover. This effect relates to a breakage of the Van der Waals forces linking the agglomerates and their partial recovery over time. The extent of recovery of the Storage shear modulus (G’) directly relates to the Dispersion Rating (DR) of the rubber compound. If the carbon black is poorly dispersed, the recovery of the Storage shear modulus (G’) will be much lower, indicating a weaker filler structure and reduced mechanical performance properties. Integrated cartridge cooling system that separates the provided air streams into cold (-45°C) and hot (+110°C) fraction to enhance the performance of the machine compared to the standard pneumatic cooling system. This system is especially suitable for testing at or below room temperature in order to provide the most accurate test results as well as correlations with final product application environments. This system is highly recommended for dynamic testing and a must for testing in the ambient temperature range. The vortex tubes are installed in line with the standard pneumatic cooling system. •	Air is accelerated and separated in cartridge centrifuges. •	Afterwards the cold fraction of the air is used for separate cooling of both test dies down to +8°C. This technology is patented worldwide by MonTech. The advanced cooling system features a liquid cooling system with an external chiller unit. The cooling system works as an addition to the pneumatic cooling system. If lower temperatures are required, the chiller unit will begin cooling down the dies to as low as -40°C. Both dies are separately chilled and cooled by the external unit connected to the instrument. The liquid cooling system is able to run anything from sample curing down to glass transition testing. The heating system of the dies remains unchanged; instruments equipped with this chiller unit maintain the functions of a Moving Die Rheometer or Rubber Process Analyzer. The high speed DAQ option offers unique result stream resolution as well as an ultimate level of precision for the torque signal and motor position. Both channels are sampled and processed simultaneously with 24 Bit resolution at a data rate of 180KHz. All data streams are provided on the PC and calculated online in realtime kernel. It is also possible to save the raw data streams to the PC’s memory. 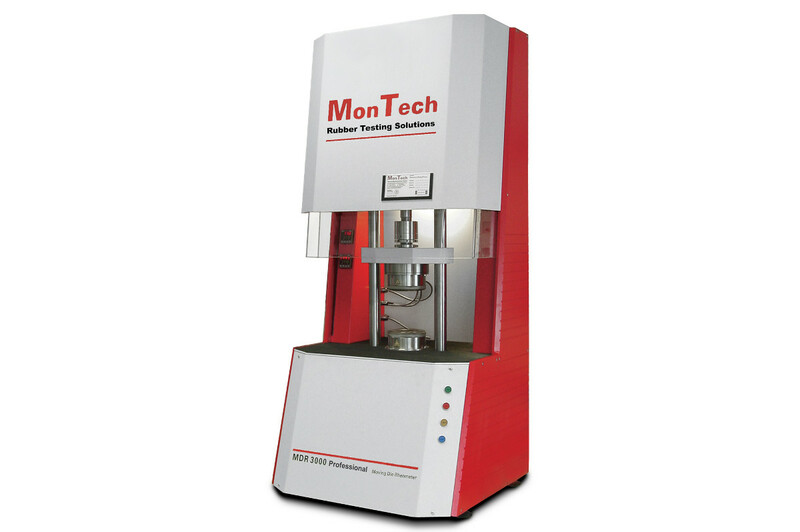 This makes the system especially suitable for FT-Rheology purposes as well as applications that require precise analysis of material responses in any harmonic. MonControl is the most versatile and easy to use instrument control and LIMS platform for managing laboratory and testing data.